Who doesn’t love an all-around good deal, especially when it is chock full of value, quality, and practicality? 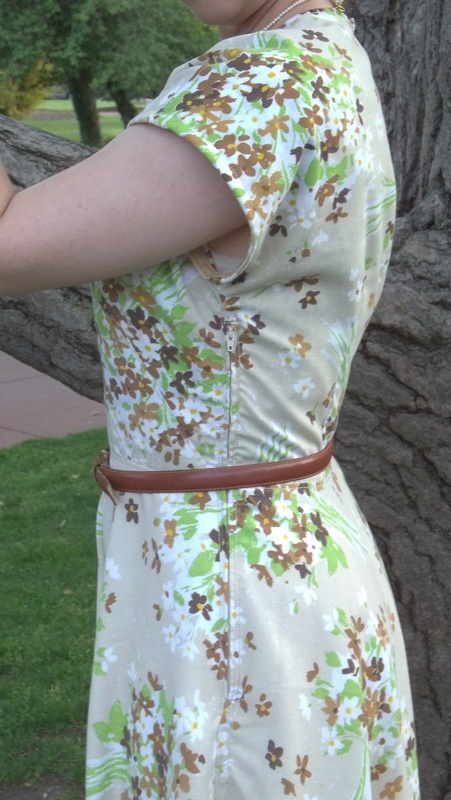 Well, I hit the jackpot here, spending less than five dollars with this dress, which is a 1940 Vintage Vogue reprint. Who would have guessed that some vintage bed linens could turn out something great like this! NOTIONS: I had every thing I needed on hand, except for the zipper, which I bought on sale for about $1.50. I had extra bias tape for the sleeve hems and plenty of tan thread as well. The back closure button came from my inherited stash. Oh- almost forgot- I bought a few inches of brown cording for only 20 cents. TIME TO COMPLETE: this dress was finished on April 25, 2013, after only 4 hours or less of time to put together – easy as pie! This V8811 dress was an absolute joy to make, and I cannot recommend it enough. It is THE easiest Vintage Vogue I have made yet. It definitely can be a one or two day project for someone, as it was for me. The full bias cut circular skirt, combined with a bodice shape that’s complimentary to the waist, creates an amazing 40’s silhouette just perfect for swinging, dancing, twirling, or plain having fun! Most of the 4 hours or less I spent on this dress went towards working on the hem. There is so much length at the bottom to hem it seemed like I just kept going. A circular hem is a must for this dress. The hemline’s curve necessitates the practice of doing long stitches and pulling them up for a soft gather to ease in a flat hem. I had to do this same thing for my ‘Star-Spangled Red, White, and Blue’ dress, with it’s full circle skirt. If you have made V8811 or know this pattern, you might be wondering, “Where are the facings?” looking at the picture above of my dress inside out. Well, I greatly simplified the pattern by eliminating the bodice facings and merely lining the dress instead. (It makes up for the time spent on the hem.) Simply cut two of each bodice piece – 1 fabric front, 1 fabric back, 1 lining front, 1 lining back. I lined my bodice in the same fabric as my dress to make it more opaque, but lining could be used instead. 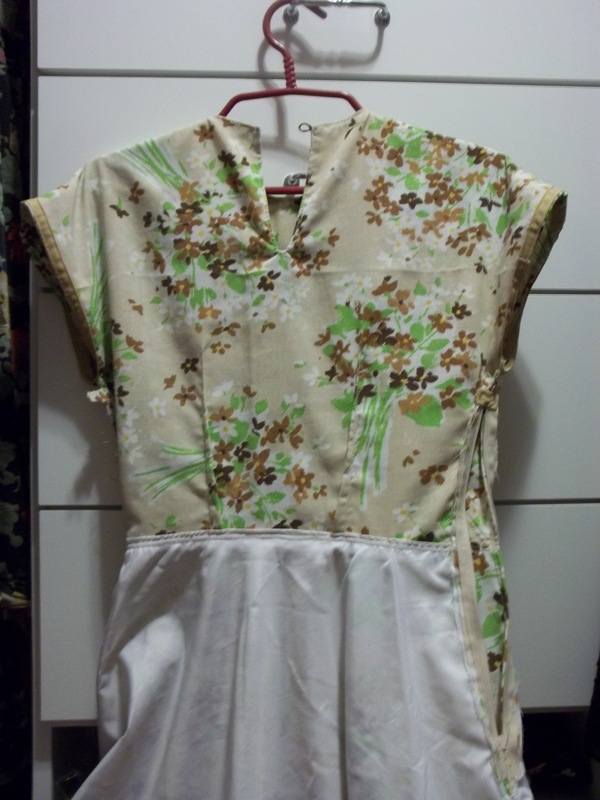 Then I sewed the four shoulder seams of both the fabric and the lining. Don’t forget to add the loop for the button! 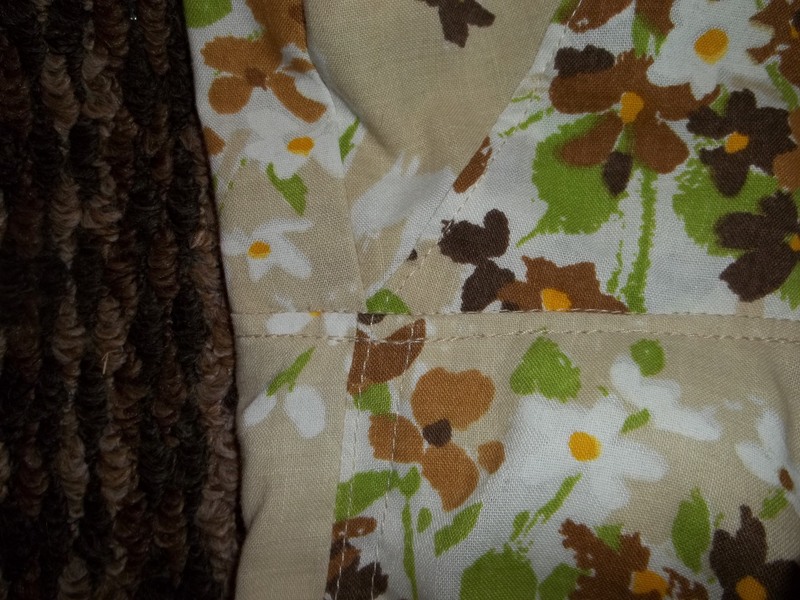 Next, match up the fabric and the lining (right sides together) and sew in one continuous stitch all along the entire neckline and following around the back slit for the neckline opening. Slash the slit, turn right sides of the fabric out, and – voila! All you need to do is top-stitch the neckline down and you have an easy and clean finish so you can quickly assemble the rest of the bodice (and dress). At right is a close-up of the back bodice so you can see how nicely my adaptation turned out. The vintage button I used can be seen well, too. Some of the buttons in my stash go back to my Grandmother’s collection, so I know this button is not new. It is clear (plastic probably), with cool facets or grooves that give it character. I was SO impressed with how true the sizing was on this pattern. V8811 is one of the handful of patterns (not counting knits) which fit like it was made for me by exactly following the sizing chart, and needing no adjustments. Even the darts matched up perfectly along the side seams. 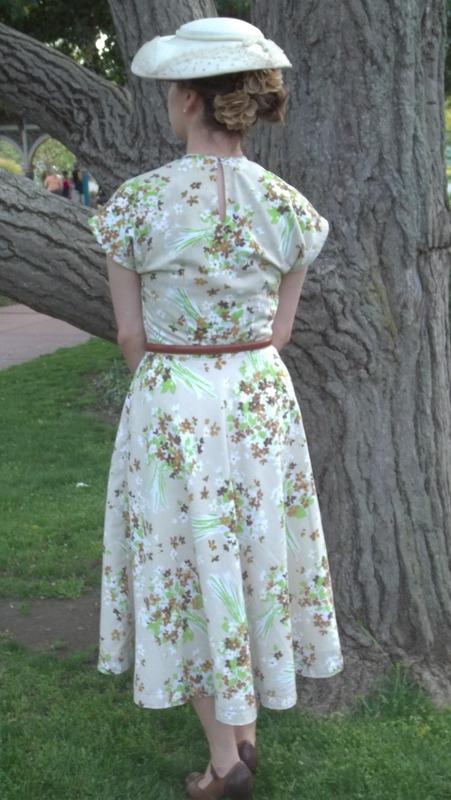 This dress has been one of my “go-to” 40’s clothing item for this spring/ summer. I’d like to prove this by showing you some of the different ways and places where I have worn my bed sheet dress. 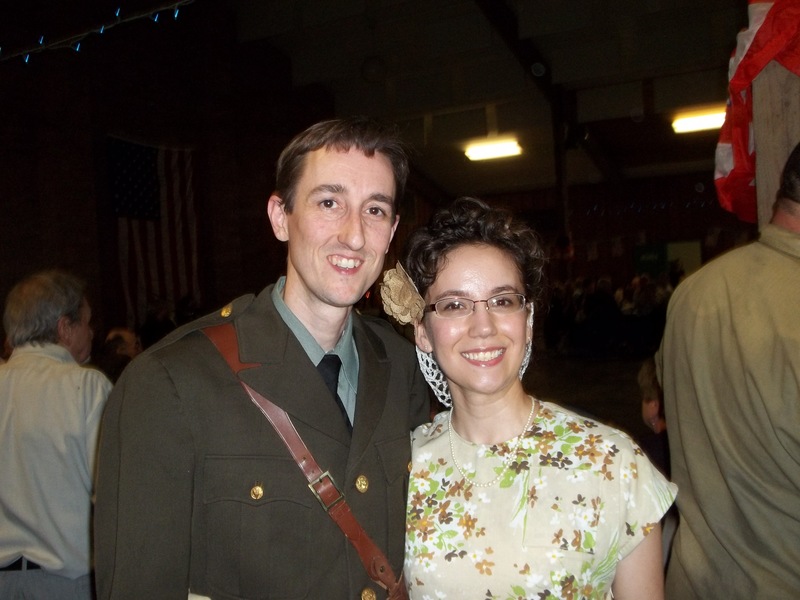 When I finished sewing my dress in April, it was done just a few days before a WWII Canteen Dance at our town’s military barracks. There I had my hair in a snood net with pin curls. 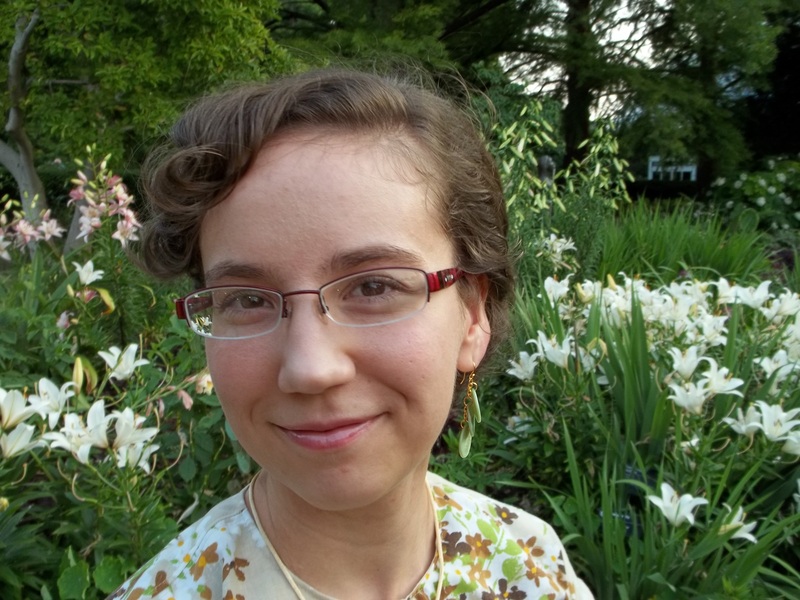 Several people (veterans) told me I reminded them of an aunt or a sister when they were growing up in the 40’s. I was flattered! However, when I told people I made my dress, and made it from bed linens, and it cost only $5…well, they looked at me like I was nuts. Oh well! Here’s we are above – hubby forgot his hat in this picture. 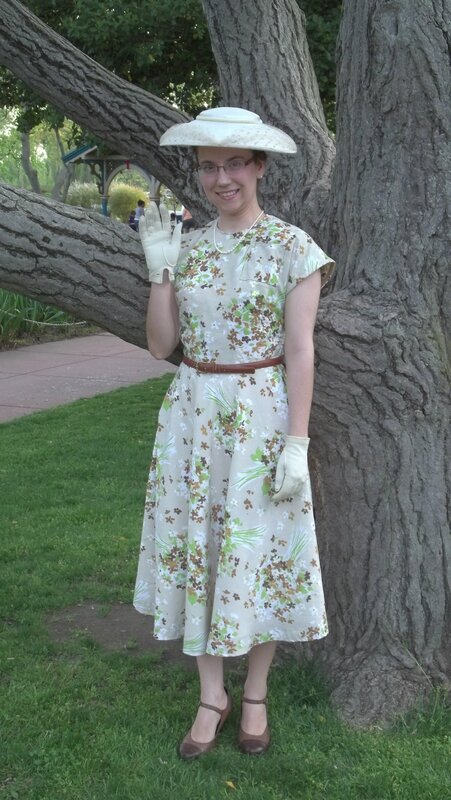 I also wore my bed sheet 1940 dress to a Big Band/Swing concert at our Botanical Gardens. 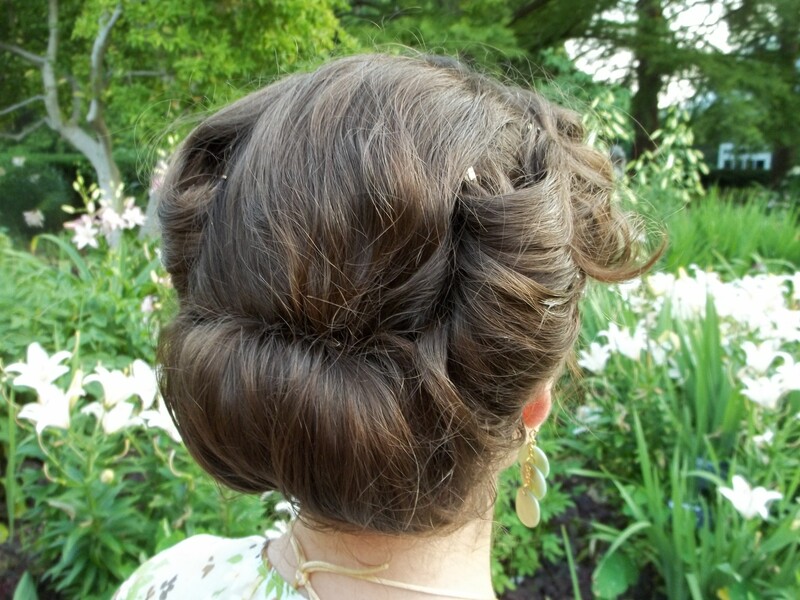 This time I accessorized with modern shell jewelry I made myself, and fixed my hair in the “Veda” style (my new favorite) from the book “Vintage Hairstyling” by Lauren Rennells. 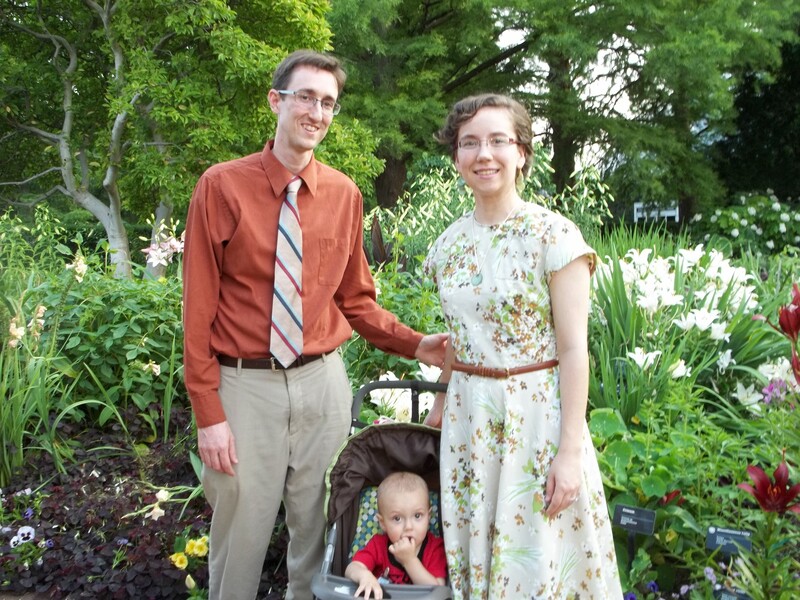 There some one said how nice it was to see a young family dressed up nice. I was disappointed I couldn’t find anyone else dressed up, much less in vintage. Speaking of swing, that reminds me of a coincidence that makes my V8811 dress even more appropriate to dance in at events. Glenn Miller’s #1 Big Band hit “In the Mood” topped the charts in the year 1940. Miller’s 1939 recording on RCA Bluebird of “In the Mood” is in the Grammy Hall of Fame. National Public Radio (NPR) included the 1939 Glenn Miller recording on the NPR 100, the list of “The 100 most important American musical works of the 20th century”. Who can resist the urge to get up and dance when hearing other famous hit songs from 1940, such as Artie Shaw’s “Frenesi”, Tommy’ Dorsey’s “I’ll Never Smile Again”, and Glenn Miller’s “Tuxedo Junction”. Try making a V8811 dress for yourself; I believe the results will also leave you dancing! 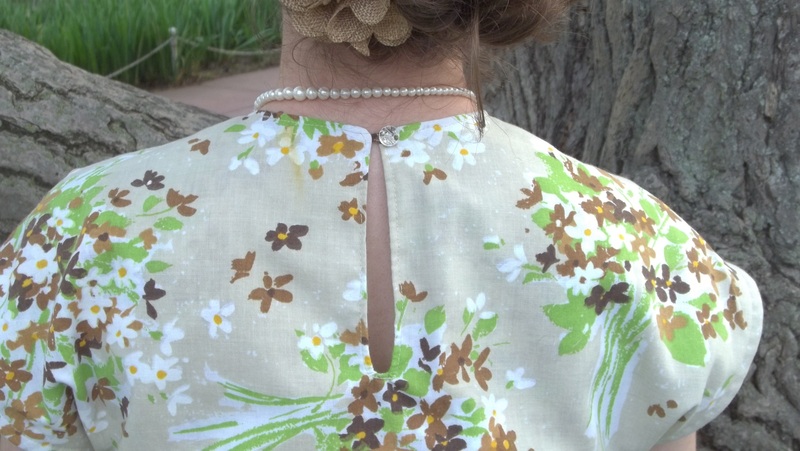 This entry was posted in 1940's and tagged "Veda" hairstyle, "Vintage Hairstyling", 1940's, bed sheet, cotton, dress, floral, swing dance, vintage, Vintage Vogue 8811, Vintage Vogue pattern, Vogue pattern by kellycb. Bookmark the permalink. I found your blog post about Vogue 8811 using a bedsheet. I’ve made numerous dresses and tunics using bedsheets. I like making dresses but don’t always want to risk $40+ of fabric on a new pattern. I get them at a local nice thrift shop. Once I even had a student of mine tell me that she thought she had a pillow using my tunic’s fabric. Plain white sheets are great for linings as well. Good luck finding cool vintage sheets. Thank you for commenting! Glad to hear that other people realize the amazing potential of bedsheets for fashion sewing, too. I do think part of their appeal is the hunt to find a good set at a great price! 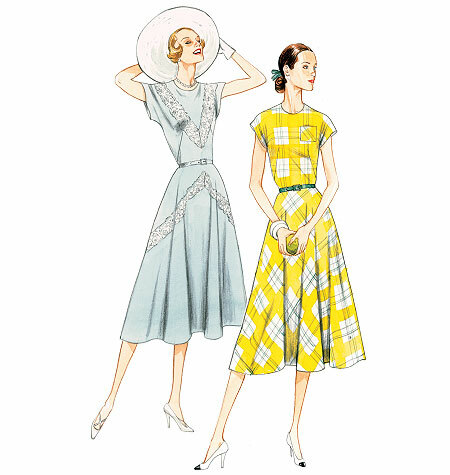 You’re so right – projects such as a full 1950s dress or a long maxi can easily become so pricey using new fabric.